The aerospace industry produces a large volume of scrap offcuts of uncured aerospace-grade pre-impregnated (prepreg) materials that are sent to landfills because they currently have no other use. Over the next two years, Boeing Winnipeg in partnership with the Composites Innovation Centre, Convergent Manufacturing Technologies and the UBC Composites Research Network will work towards developing the capability to reuse those landfill-destined materials. With funding support from the Green Aviation Research & Development Network (GARDN), this project will provide new opportunities and a green alternative for the aerospace industry. 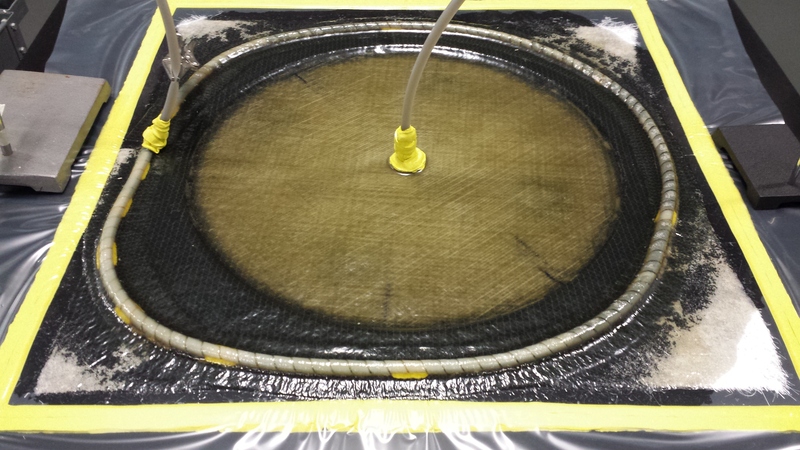 When a composite part is made with uncured carbon fibre or fibreglass epoxy prepregs, the material rolls are run through a cloth kitting process and the plies are trimmed to the shape they need. The excess off-cuts are typically disposed of as scrap. One of the main constraints for reusing the material is that it is designed to be cured in an autoclave under high heat and pressure. For aerospace products this costly prepreg raw material and its processing is acceptable due to the demand for high performance structures. For most other applications with higher production rates, this process is too costly and time consuming. This collaborative team is looking at how to make this material useable and its process manageable without an autoclave, at lower temperatures and shorter cure times. This is initially an applied science-based project that will run simulations for alternative cure parameters and determine the best practices for salvaging and consolidating the material. Product demonstrators will then evaluate alternative manufacturing technologies with a focus on making the business case make sense for other applications. Some of the potential end uses are vehicle seats, sports equipment, musical instrument cases, luggage, aftermarket parts such as wheel rims and small boats/canoes. This project gives the aerospace industry the opportunity to redirect those materials into value-added industrial, commercial or consumer products and support a new industry for “reclaimed prepreg” that will benefit the economy and the environment. Imagine how much easier the job of lifting a manhole cover out of the ground would be if it weighed 40 lbs versus 150 lbs. 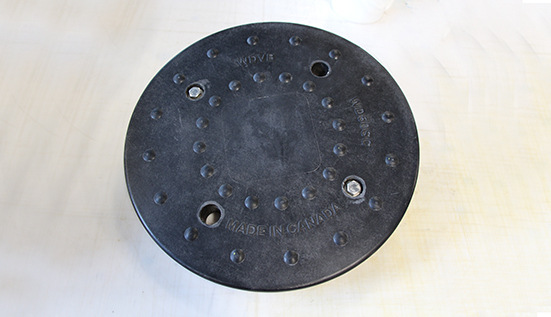 We worked with WD Industrial Group to create a light-weight composite manhole cover to replace traditional metal covers. WD Industrial Group is a Winnipeg-based organization that designs and manufactures products for the industrial sector using materials ranging from plastics to cast iron. 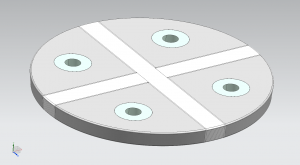 They were working on a new manhole cover and brought in the CIC to assist with the prototyping, design and testing of the cover. 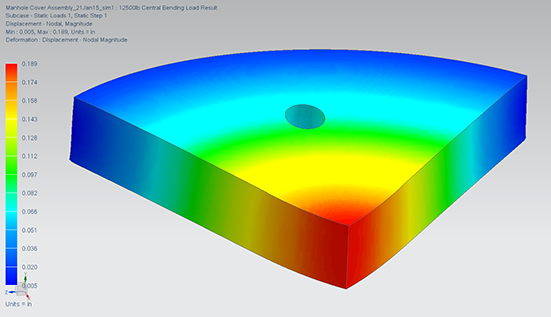 The CIC prototyped the initial design that WD had and subsequently provided shear testing and finite element analysis (FEA) services to create a final cover that met their requirements. The final design included a solid laminate cross in addition to core material and four urethane inserts. Two of the inserts are there to help with lifting the cover out of the ground and the other two are for the locking mechanisms to be attached. There was concern that when a load is applied to the cover, such as from a vehicle driving on it, that there would be delamination between the urethane and the fibreglass. The FEA was performed to assess the bond and results showed that the bond, and the cover, is strong enough to withstand a 50,000 lbs distributed load. The final design reduced the weight to roughly 40 lbs, which allows one person to be able to pick up the cover and it features a locking mechanism to ensure the light-weight composite cover would be secure. The first production run of 50 manhole covers has been sent to the City of Winnipeg for field testing, with hopes for another production run later this year.